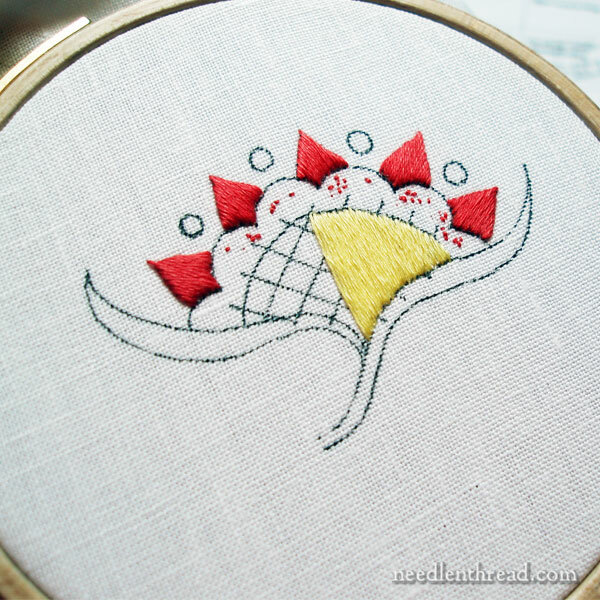 Once upon a time, in the deep, dark recesses of time (as in, two or three years ago), a rather addle-brained embroiderer (that would be me) set out on a stitching adventure with two of her best friends: Floche and Satin Stitch. Over peaks and through valleys, the three risked life and limb (ok, maybe not) to complete an Embroidery Quest and reach Embroidery Paradise (or at least, to complete a little test project). Like many an adventure in this less-than-intrepid embroiderer’s life, this particular one didn’t go so well. At first, yes, all seemed Sunny Skies and Happy Wanderings. But then things started getting a bit criss-crossed. And then the adventurers parted ways, and they left their quest unfinished. And while they’ve met here and there for other adventures, they never quite forgave themselves for abandoning this particular quest. And to make matters worse, they didn’t keep adventure logs, and they lost all their maps and what little treasure they had accrued. The other day, I received an email – a rather scathing one, but all in fun – from a friend who reads Needle ‘n Thread and who stitches quite a bit. She took me to task over my suggestion to keep a notebook, saying that I unnecessarily complicate embroiderer’s lives with these extraneous suggestions. If I had to keep a notebook on every bit of stitching I do, I’d never get any stitching done. Note-taking would hang over my head every time I sit down to stitch. I can’t think of one instance in my life, where I wish I had kept a notebook. Seriously, can you? Especially with your blog, why would you need a notebook? Can you think of one instance where your notebook was indispensable? Where it saved you time? They just take up time! They don’t save time! Set yourself free and trash the notebook! You’re just complicating your life! In addition to this little tête-à-tête, I had several other well-meaning inquiries about the whole purpose of keeping a notebook, after I wrote this article a few weeks ago. My story above is written to explain why a notebook can prove to be indispensable, and to defend my advocacy of keeping at least basic notes on your embroidery projects, especially if they are projects that you’ve concocted yourself. In this particular case, I’m in the midst of writing a series of articles for DMC, and to illustrate the articles, I need my own photos of work with specific threads. When considering floche, my mind immediately flew to this project. Unfortunately, when I began this particular little project several years ago, I was not a notebook keeper. I no longer have the pattern. I no longer have the finished project. And I never kept a color list. And so, here I find myself back at the drawing board, using valuable time to stitch up new samples. If I had kept an accurate notebook, this wouldn’t be necessary. If you feel that note-keeping isn’t for you, no worries! You don’t have to keep a notebook! If it puts undue pressure or stress on you, if it takes away from the pleasure of stitching, then why do it? If you have no foreseeable reason to ever have notes on your projects, don’t worry about it. But if you’re concocting your own projects, if you think that some day you may want to know exactly what you did to create that project, then it’s a good idea to keep one. If you have Any Inkling at All that you would like to go into business somehow with your embroidery – maybe you want to create designs and kits or something like that – then, by all means, keep a notebook. A notebook isn’t essential to good embroidery, so if you have no reason to keep one, don’t bother. I hope I didn’t somehow give the impression that keeping a notebook is a crucial part of every embroiderer’s routine. But if there’s even a chance that, some day, you will need to know what you did on an embroidery project, you’ll be thankful in the long run if you keep at least minimal notes on your own projects. Lol: to each his own. Some keep detailed notes and lists (I do), some don’t. We do what works best for us. How I work would drive someone else insane, and vice versa. Oh dear poor you, I think it is a personal choice whether you keep a notebook or not, if you are a professional embroiderer and you create and design patterns and choose the thread and thread colours then I would think it’s necessary to keep a notebook for reference, especially to refer back when others use your patterns and have queries on threads and thread colours, it’s part of the job of a professional embroiderer. I don’t keep a notebook because I don’t create patterns and choose threads or thread colours for my projects, I leave that to the professionals who have done the hard work already. So take heart Mary as embroidery is your profession then I think you are right in keeping a notebook. Oh by the way I love the satin and lattice stitching on the design above. I hope you have a great weekend. You are right ! An embroiderer MUST have a note book, or at least a box where she keeps all the sheets of paper where she puts all the details for everything she tries; and then, no asks and no problems, just go and see ! Happiness ! Plus, I have them listed in my phone in the exact color gradation that I lay them out in, in case they get jumbled up by my husband moving them. I must humbly beg to differ with your correspondent. I have done a good bit of sewing of various types, and I’ve kept a notebook after losing little slips of paper with stitch settings and whatnot written on them. You always think you’ll remember what you’ve done. You don’t. The most beautiful stitch is the one for which you have no notes. I keep notes on all my projects in my PDA (yes, I am old). I record start and finish dates, any substitutions, fibers and fabrics used, whether a kit runs short of floss, mistakes that I make and fudge (or not), changes or corrections to patterns, and lots of other things. I like being able to look back at this stuff years later. 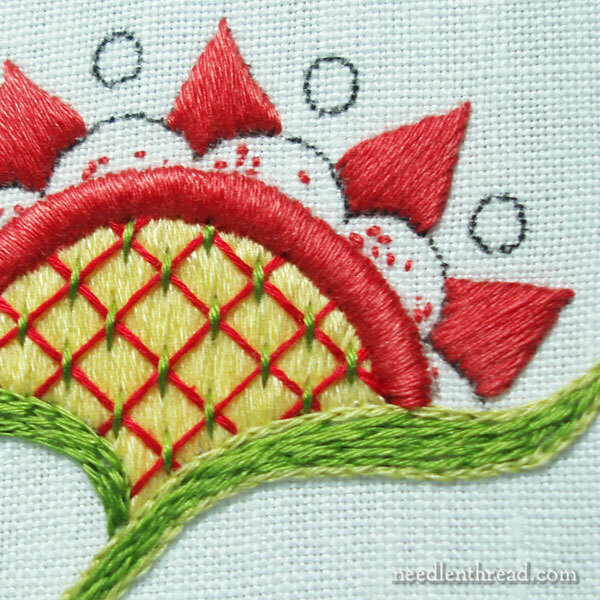 In a few cases, I can pass some helpful info on to friends stitching a design that I have already stitched. That said, I like keeping this information and I like having it. As Mary said, if you don’t enjoy that, there’s no critical need to do it. Mary, Keep hope that Satin and Floche will still be recovered Thanks for the tale. Hey, daydreams can be lovely. So I have begun to keep a notepad on my iPad. Basically, links to pages at NEEDLENTHREAD.COM ! Anything I need to remember is here! May I give you a big virtual hug for being a great mentor and friend? Thanks for all you do! Mary, I have discovered that I take notes when I have made a mistake and the mistake itself has turned out rather interesting looking and nice. This way I can remember the mistake ( of course note what project it was) and use it somewhere else. I wish I had started a notebook when I began quilting 18 years ago; I did start a notebook when I began to learn Embroidery 2 years ago and I am glad I did, I have notes and samples pasted into it, I find it really useful as I always think I will remember but I never do! Count me as a vote for using notebook. I started keeping a stitching journal some years back. Mostly a record of what I worked on, start stop dates (1 star for starts, 2 stars for finishes), and occasional other notes. Not easy to search, but that wasn’t my purpose. Before that, I jotted notes on separate sheets of paper, and they all seemed to go in different directions. At least now I know where to look. I’ve made note of stashing trips, signing up for workshops and correspondence courses, knitting crocheting prayer shawls, and sometimes what’s keeping me busy (instead of stitching). Most days it’s just a line or two. Do I ever forget to write? Of course, so I may make a general “catch-up” entry. But when I hit the “I don’t seem to be making any progress” doldrums, I can see what’s going on. I’m not a diarist, except for my stitching. Nothing special, but it’s become part of my life. I personally swear by notetaking, though I often swear at myself for not doing it consistently 🙂 I have a notetaking program in my computer, and it’s been fantastic for noting details on projects – embroidery, knitting, spinning, crochet, and weaving mostly. And because it has a search function, it’s easy for me to find information, whether it’s all the projects I used a particular color in, or projects I did in a particular month, or whatever else I want to know. Well, this is a first! It’s the afternoon (cst) and I am the first (perhaps only?) to comment. One of the first things all my painting/art classes at University have insisted on is a sketchbook. However, it isn’t just for sketching;it’s used as an ‘idea’ book. Not only are sketches in it, but dabs of paint color for the ideas attached to the sketch, instructor input, areas to consider, etc. I think the easiest way (for me) to keep something of the same for embroidery would be to snap a quick pic w my ‘smart phone’. Post the pic on a ‘Word’ file and add any necessary information. Then I’d keep a folder on my (computer) desktop for the info. The document would be titled with the project name, such as ‘crewel emb. pomegranate’ and date started. Then I can just look at the document pics if for some reason the title didn’t spur my memory. No need for extensive notes, just snap a pic of whatever instructions/patterns are included on the project, especially any thread/floss Color Numbers. Considering I have limited time for embroidery when school is in session the ‘notebook file’ might come in pretty handy. I’m a big believer in taking notes, although I use journaling software rather than a physical notebook so I can easily edit and incorporate photos alongside my notes. I do a lot of experimenting, not just with embroidery but also with other fiber techniques. Sometimes I won’t return to a particular technique for months. Without my notes, I’d never remember what worked and what didn’t or exactly what materials I used. I also dye all my own threads and those notes are absolutely necessary if I run out of a particular color and need to dye more. LOL, you need a Ravelry for embroiderers. Instant, online place for notes and all that color/needle/pattern information. Too bad it doesn’t exist. I agree with you 100% Mary! For most of my stitching life I have not kept notes on my projects because I was stitching other people’s designs as a way to relax. They were almost all cross-stitch too, so there was no need to keep notes. Now that I am branching out into other areas of embroidery and playing with my own designs, keeping notes is essential! I completely understand the issue of not keeping good notes on a something and later finding it hard to figure out what was going on. I’ve even had a case where I kept what I thought were really good notes on a project only to find later, when I was writing, that I was no longer sure what I meant at the time–it was my Masters thesis; not embroidery related, but the point remains. Good notes are essential if you plan to do something with your project later. Forgive yourself for your earlier lapse. I know it’s frustrating now but it was a long time ago. Here’s another vote for keeping a notebook. I like to keep track of colors / brands used, shading sequences and stitches used. I find that some colors work up better or worse than I thought they would and I get really excited if I find an especially pretty group of colors for shading. The notebook gives me a record I can easily check should I wish to use the colors on a future project. I also keep a stitching project book and include my notes and pictures of works in progress and finished projects. It is my hope that some day my great, great granddaughter might find it interesting how I put my stitching projects together. I try to always keep a notebook about projects, especially ones that are original. I often have to put something down and walk away, the notebook is invaluable when I come back (which may be quite a while later. Keep notebooking! Mary how crewel of you. Talking about satin stitch and floche. Threads…I really love Floche and especially for satin stitch it always looks lovely and smooth. The cost from overseas is getting a more costly these days an adding postage! Not all doom and gloom makes me finish UFOs which have the appropriate threads with them. I never steal as you can forget to repay and if there is a dye lot change well new problem. Here in Australia distance is an enemy. Our $ is low these days 71cents to US $. Not to mention the Euro. Nevertheless we must go with the flow. Don’t have an alternative. Our Government has now proposed a 10% GST/VAT on under a 1000$ which is ironic as they won’t raise taxes for the most wealthy. That’s for another day. Now Mary, Mary joy of my heart. If I were to keep a note book on every bit embroidery I would have albeit a very small section (large for me) in the Library of Congress. Even so I do like to add to the work completed a sample bag with a list of colours used six inch piece of each thread, 4″ piece of ground/& backing if used. That is only for a special or commissioned piece. Some times if there is not a lot left over, I give that. I usually do that for kneelers as they (could) be mended more often. So it is in the luck of the wind through the brain and the ability to match colours. Or in the Louis conservation colours those are hand dyed using what was used at the time. Short answer to notes for all. I say to all, are you out of your minds. That’s your choice. From cold Australia. Spring will come…. I usually work from kits or magazines, and I keep the instructions for the kit or keep the magazine. I have a small album where I can slip photos of each project that I have finished, but it’s not complete. I suppose if I ever created something from scratch, I would need to keep notes on what I did. I’ll remember to do that! I find that I could not keep a notebook even if I wanted to do so! You see, I started embroidering many, many years ago. About 30 years ago I found those cute little cardboard squares and I spent evenings watching TV and winding each DMC skein onto those little boards. I never (and here comes the confession) thought to write the DMC color number on the little cardboard square. Yes, (gulp) I threw away all of those little circles of numbers (oh, horrors!). When I would start a new project, I would look at my plastic bins with those cardboard squares filed by color group…and I would just pick whatever colors I liked! Once I found your blog a few years ago, I realized that knowing the number would really be an advantage! So, now when I am near the end of any color thread…I keep about 18 inches of the 6 ply and I go to Joanne Fabrics and march right to the embroidery thread aisle and spend time matching my strands with the colors in the “wow, look at the hundreds and hundreds of wonderful colors” rack! When I get home, yes, I wrap the new thread on the little boards PLUS now I do put the number on the corner of that little cardboard square! Someday, I may have enough numbers listed so that I can keep a notebook…but for right now, I just continue on by choosing whatever color strikes my fancy! I’ll never be an instructor and no one will ever be interested in my stitching. I did learn one lesson however. At first I would stitch items, give them away or have them tucked away here at home. Now I look at them and wonder: where did I get that pattern? Who is the designer? So now, at the least, I take a picture and make a note (no book required) to go with the pic on my computer of the pattern name and designer. I enjoy looking at all the old things I’ve made and feel better sharing the picture on Facebook if I can give the designer credit. I don’t “journal” per say, but I do take weekly update photos of projects and post them on social media with comments (usually along the lines of I made a boo boo or I didn’t get as much as I’d want done, occasionally I didn’t feel like I got much done, but compared to last weeks pic, wow I zoomed!). I don’t note down color changes (like 2 wedding pieces in the past year) except on my working copy as I usually just make simple substitutions like pink flower to purple. If I was going to modify a huge element of the piece which was already a complex color scheme I would keep my notes. Especially if others showed interest in re-creating it. 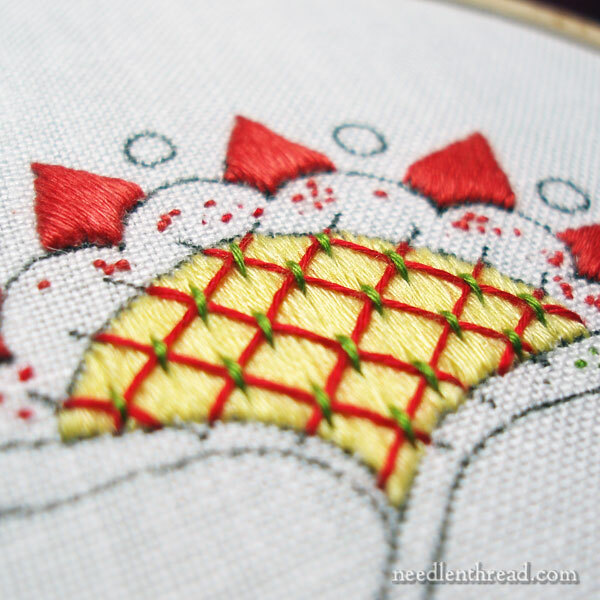 Mary, there’s an old saying, An ounce of prevention is worth a pound of cure.” I so enjoyed reading your blog “The Lost Adventure of Satin Stitch & Floche” which certainly illustrated that with a little planning each of us can help prevent future headaches. I plan to continue learning from you and keep the nettlesome notebook for each of my projects. I might even practice my stitching on a “Nettlesome” cover for my first project notebook. Maybe DMC could offer notebook cover kits for inspiration each time we face recording our stitching notes? Thank you for your creativity. I’m with you Mary – I like to keep a notebook handy. I use it to note down colours of threads and little reminders of how I solved a problem and other hints and useful tips that I may use in future or may not. I use one for lacemaking mostly. I find that I often write in it when I’m thinking about embroidery not doing it, so it doesn’t detract from the enjoyment.